If you’re not totally enchanted with your Melos, your orders are eligible for a refund, store credit, or exchange if returned within 30 days of delivery. 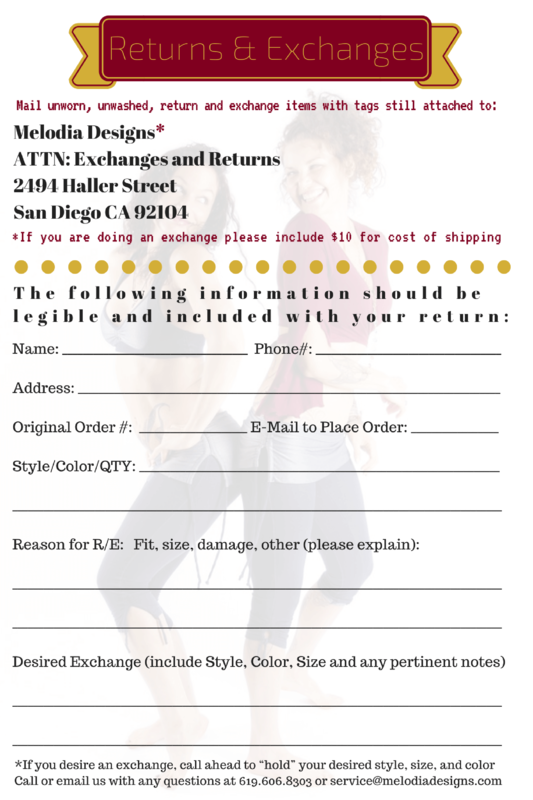 Print and Complete the Return/Exchange form and enclose it with the merchandise. When exchanging items, be sure to indicate your top three replacement choices including quantity, color, size, and style. Melodia Designs will fill your exchange request according to available inventory. Items must be unworn, unwashed, with all original tags and accessories attached. Sale, discounted, and special order items that are marked FINAL SALE are not eligible for refund, exchange, or store credit. Refunds, credits, & exchanges are typically processed within 3 business days of receipt. * Merchandise must be returned within 30 days of receiving your order. * Merchandise must be unworn, unwashed, and free of any alterations or damages. * Merchandise must have all tags, including any Melodia Designs hangtags, attached. * All purchases of undergarments are final. * Returns must be issued as credit to the original form of payment. If this is not possible, returns will be issued in the form of store credit. * We do not provide exchanges for International orders at this time. * Final Sale purchases are not redeemable for any type of store credit, exchange, or refund. 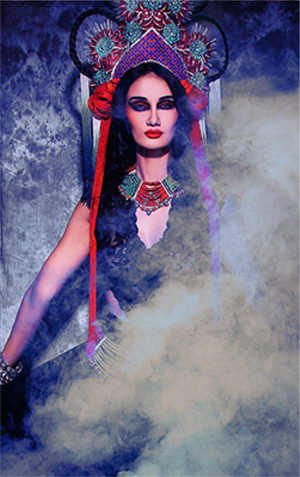 * All Sale items are FINAL SALE purchases; any item purchased at a discounted price is FINAL SALE. If any returns do not meet these requirements, you will be contacted and the items will be returned to you immediately. We reserve the right to refuse a refund if the items have any signs of wear, alterations, misuse, or damage. Any additional questions? Please contact us at service@melodiadesigns.com. - $10.00 CASH or Money Order for one item and $3.00 for each additional item. You are responsible for all taxes and tariffs incurred. We do not provide exchanges or reimburse return and/or undeliverable shipping charges for International orders at this time. International customers are responsible for any additional customer taxes and/or tariffs placed on packages at Customs. These taxes and/or tariffs vary from country to country. We only charge sales tax on orders being shipped to California addresses. Based on Constitutional guidelines for interstate commerce, states can only require companies to collect sales tax in states where they have business operations. Sales tax will be applied at a rate of 7.75% to subtotal + S&H charges. We proudly ship via UPS. Please note that UPS does NOT ship to P.O. Boxes. Please contact us if you need expedited shipping. We offer UPS Next Day Air Saver – by 3:00pm or 4:30pm the next business day to commercial destinations. Customer must call for this service. Not guaranteed. We offer UPS 2ND Day Air – by end of the second business day. We offer UPS 3 Day Select – by end of the third business day. We offer UPS Ground – Day-definite delivery. We offer UPS Worldwide Expedited – Day-definite service to more than 60 countries and territories. Most items ship within or up to three business days , pending availability and credit verification (M-F), (Please note that we usually SHIP within three business days, not DELIVER within three business days). Saturday and Sunday will begin processing on the following Monday. MelodiaDesigns.com will contact you with a follow-up email and/or phone call if the merchandise you have selected is not currently in stock or if we need to confirm availability or offer an alternative item. Only business days are counted in transit time. *DELIVERY TIME DOES NOT INCLUDE SATURDAYS SUNDAYS OR HOLIDAYS. If delivery of a package is refused, rejected, or returned for delivery failure or any reason, we reserve the right to charge your credit card for both outbound and inbound shipping charges as well as any additional charges that we incur as a result.